26.2 Quest: Lace 'Em Up For Boston! 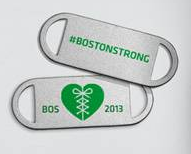 Runners can obtain the #BostonStrong Lace Medallion for five dollars per pair. 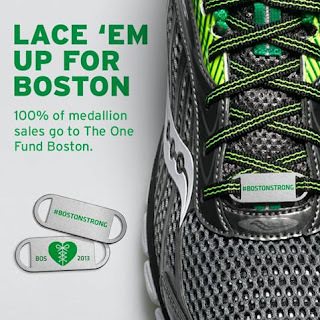 For every pair of medallions purchased, Saucony will donate 100% of sales to The One Fund Boston, established by Massachusetts Governor Deval Patrick and Boston Mayor Thomas M. Menino to help the victims of the Boston Marathon bombings. Consumers can pre-order the #BostonStrong Lace Medallions at saucony.com beginning Wednesday, April 24th. Medallions will be available to ship within three to four weeks. Consumers are also encouraged to go to onefundboston.org to make a direct donation. About Saucony: Saucony, a division of Wolverine Worldwide, is a leading global running lifestyle brand that fuses performance, innovation and style to create compelling footwear and apparel with its widely recognized brands Saucony and Saucony Originals. Founded in 1898, Saucony continues to inspire runners everywhere with its award winning innovations, including the “Geometry of Strong™, ProGrid™, PowerGrid™ VIZIPRO® and AMP PRO2™ apparel. At Saucony, a good day is when we get to run. A great day is when we inspire someone else to run. For more information, go to www.saucony.com.